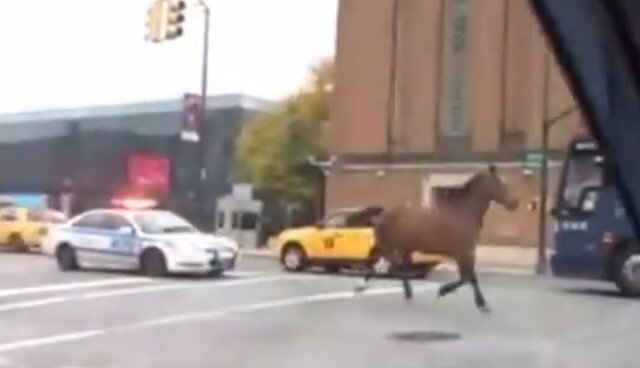 It is unclear where the horse was coming from, and the NYPD has yet to release details on his capture. The Dodo is waiting on more information from the NYPD. The animal was seen in Hell's Kitchen near both the West Side Livery, on 38th Street, and Byrne Stables, on 37th Street, according to NYCLASS. The incident may seem bizarre, but it's not the first unusual occurrence that has happened in New York lately. In fact, over the past two years, over 20 accidents have occurred in the city - and those are just the known accidents reported by the public. These and other issues associated with the industry have led to widespread protests against New York's carriage horses in recent months. "This is the latest example of why horse drawn carriages are not just inhumane but entirely unsafe in a city congested with cars, trucks and buses," Allie Feldman, Executive Director of NYCLASS, told The Dodo. "It's time for the City Council to act and get the carriage horses off the streets of New York City." Supporters of the carriage horse industry say that the horses are well cared for and are a staple of New York's culture. But animal welfare advocates argue that working in busy traffic and risking accidents isn't "humane," and that vintage-style electric vehicles could easily replace the carriages. That goal may not be so far away, either. Mayor Bill de Blasio made it one of his campaign promises to end the carriage horse industry in New York for good. In April, he said that the horses would be off the streets (and into a sanctuary) by the end of the year. He added that a bill was being drafted in City Council to achieve the ban. "A humane society doesn't do that to animals," he said. "That is part of making change in the world."